A delicious chocolatey mess. Photo courtesy of Jacques Torres. This week, Fathom editor Berit Baugher toured the chocolate factory of Jacques Torres, New York City's favorite chocolatier. Her favorite part: the chocolate chip cookies. Ever your servant, dear reader, we got the recipe. 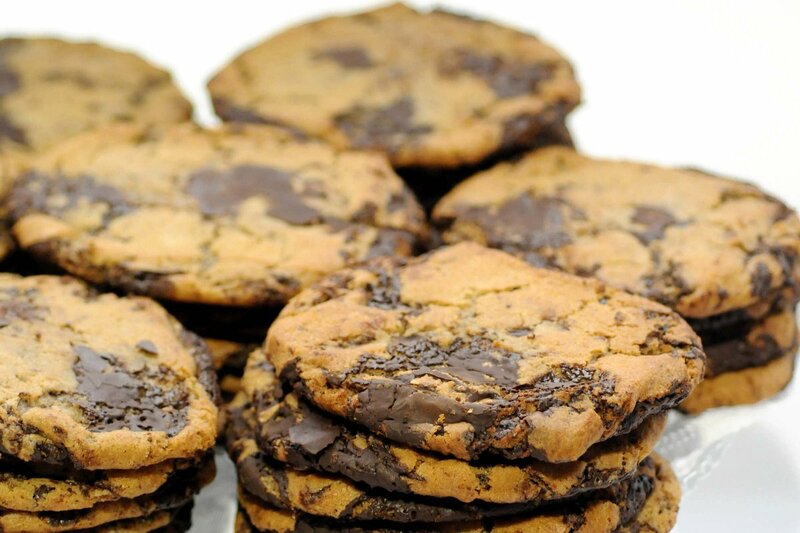 If there is one chocolate chip cookie everyone should eat while visiting (or, in my case, living in) New York City, it's at Jacques Torres Chocolate. Thin, oversized, chewy, and served warm with dark chocolate oozing from all sides. It's nearly impossible to escape without getting chocolate on your hands and face, but, oh, what a delicious mess. I was so taken by the cookie that I asked Torres for the recipe. Sweet man that he is, he obliged. 1. Sift flours, baking soda, baking powder, and salt into a bowl. Set aside. 2. Using a mixer fitted with paddle attachment, cream butter and sugars together until very light, about five minutes. Add eggs, one at a time, mixing well after each. Stir in vanilla. Reduce speed to low, add dry ingredients, and mix until just combined, five to ten seconds. Drop chocolate pieces in and incorporate without breaking. Press plastic wrap against dough and refrigerate for 24 to 36 hours. Dough may be used in batches and can be refrigerated for up to 72 hours. 4. Scoop 6 3 1/2 oz. mounds of dough (about the size of generous golf balls) onto baking sheet. If any chocolate piece are poking up, turn them horizontally; it will make for a more attractive cookie. Sprinkle lightly with sea salt and bake until golden brown but still soft, 18 to 20 minutes. Transfer sheet to a wire rack for ten minutes, then slip cookies onto another rack to cool a bit more. Repeat with remaining dough, or reserve dough, refrigerated, and bake remaining batches the next day. Eat warm, with a big napkin. Note: Chocolate disks are sold at Jacques Torres Chocolate; Valrhona fèves (oval-shaped chocolate pieces) are sold at Whole Foods. There are ten Jacques Torres locations throughout Manhattan and Brooklyn, but I'm partial to the original, a true labor of love built and painted by Mr. Torres himself.